Harold Yates was born at Sunny Corner, NSW. In 1911 he was one of the first to receive a teacher training scholarship awarded by the Education Department. 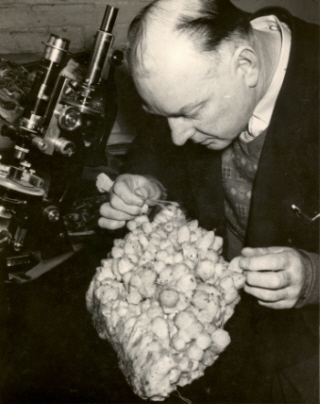 Harold Yates graduated from the University of Sydney in 1918 with a Bachelor of Science with first class honours, and was awarded the University Medal for Geology, and the Dean Thomson Scholarship for post-graduate work in Geology and Mineralogy. He later obtained a Master of Science for his thesis on a geological survey of the Burrinjuck District of New South Wales. In 1919 Harold Yates was appointed Demonstrator of Geology and Mineralogy at the University of Sydney, then, on 1 June 1920 was appointed to the Ballarat School of Mines (SMB) to teach Geology, Mineralogy, Petrology and Mathematics. He remained in that position for 42 years, until his retirement in September 1962, but continued teaching in a part-time capacity. The display-lecture room at Lydiard Street was named the Yates Geological Centre at the time of his retirement. Harold Yates was well published in his field. His most notable title being the 1953 work 'The Igneous and Volcanic Rocks of the Ballarat Area'. The University of Ballarat (now known as Federation University Australia) honours Harold Yates with a first year School of Science and Engineering scholarship which bears his name. 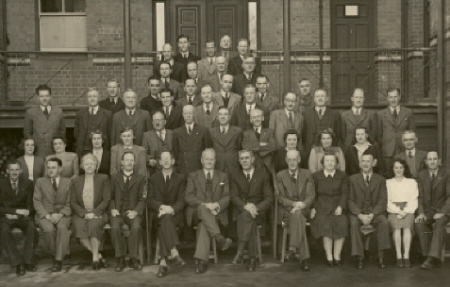 Image caption (LHS): SMB Staff, 1946. (Cat.No.0217) Back row L-R: F.L. Collins, A.W. Bridson, J.J. Hanrahan, H. Brew, G.W.Cornell. Second row L-R: J.T. Collins, R.W. Whitla, S. Mayo, Neville Bunning. Fourth row L-R: A.C. Miller, A.V. Gilpin, T.R. Gordon, R.P. Flower, HAROLD YATES, D.Mullins, T. Trengove, W. Wilkinson, Lindsay Hillman, D. Fairbank. Fifth row L-R: A. Johnson, A. Jones, M. Fogarty, Hester Darby, J. Allsop, W. Patterson, A. Lambert, H.Goldsmith, M. McTaggart, C. King, M. Harland, F.G. Proctor. Front row L-R: N.W. Penrose, R.R. Clader, S. Williams, Dr Pound, C.F. Jeffrey (BJTS Principal), A.F. Heseltine (SMB Principal), D.I. Johnson (Head of Art). J. Sutherland, R.H. Lonie, F.E. Ferguson.